Do you have a Java application that runs fine at first but slows down after a while, or it runs fine for a small number of files but performance degrades for large number of files? Maybe you have a memory leak. When fixing memory leaks; If someone were to ask me: “If you knew back then what you know now, what would you tell yourself?”. Well, I would say….. While in general the approach described in this article is IDE & OS independent, I used Linux [Fedora] and Eclipse [Plugin development] in the screenshots & instructions. Works fast at first, but slows over time. A memory leak in Java (who would’ve thought heh?) can occur if you forget to close a resource, or a reference to an object is not released. e.g. Hash maps keeping references alive if equals() and hashcode() are not implemented, e.g. Inner classes that reference outer classes can leak. (make them static to avoid). How does one go about fixing them? There are two approaches. The first is a ‘quick fix’ attempt. If that fails then you’ll have to go down the long road. 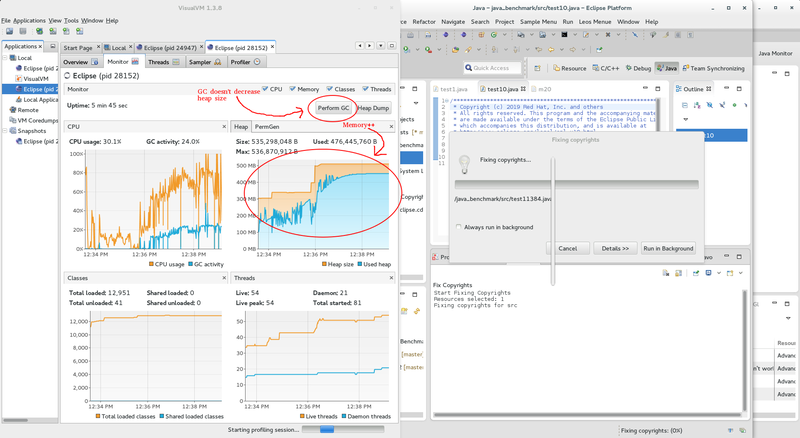 2) Manually disable & enable parts of your code and observe memory usage of your JVM using a JVM tool like VisualVM (or Jconsole, or Thermostat). 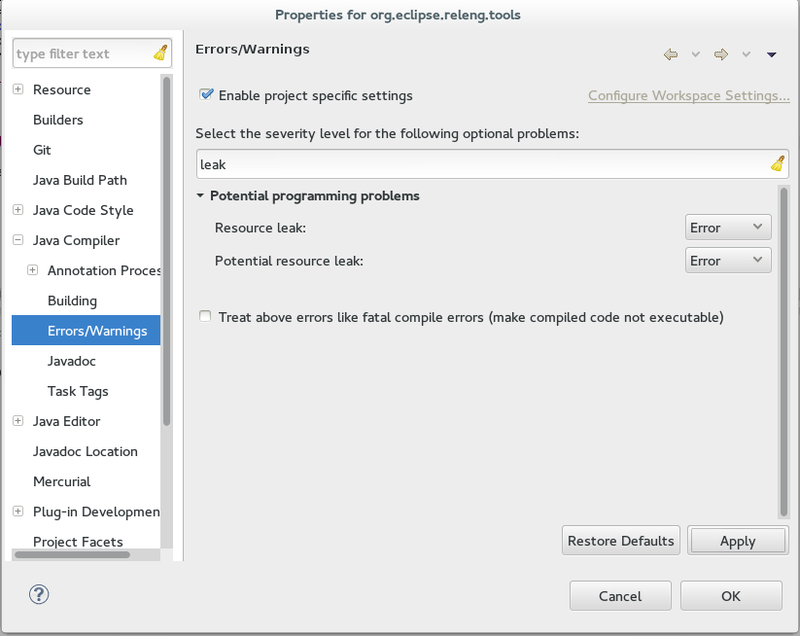 1) Quick fix: Eclipse Memory Leak warning/errors. However, even with fancy Eclipse hocus pocus, not all file closures and leaks are detected. Especially when working with legacy (pre 1.5) code, you’ll likely run into leaks because those were written before ‘closable’ was implemented. Or sometimes file opening/closures are nested so deeply that eclipse won’t detect them. If you’re in this place, you may want to try step 2. 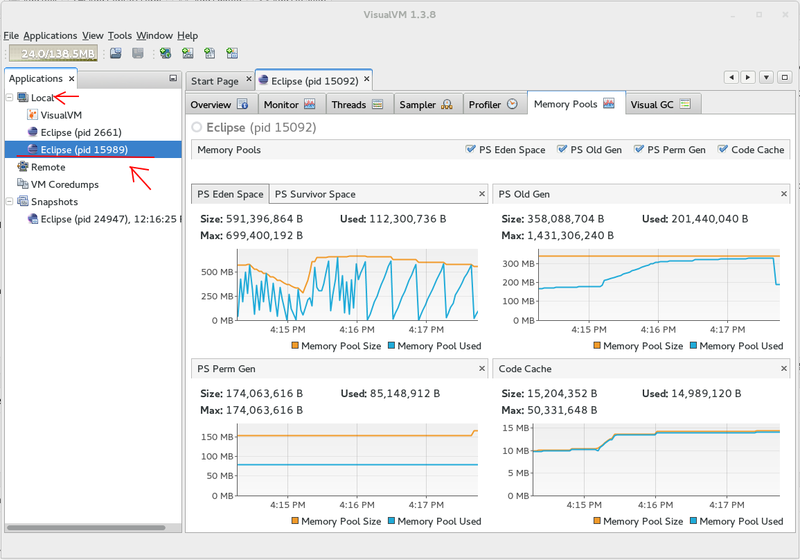 2) Manually disable & enable parts of your code and observe memory usage of your JVM using a JVM tool like VisualVM. Open terminal, navigate to …/visualvm_xyz/bin run the shell script './visualvm' (or visualvm.exe on windows). You should see the main window. If you expand ‘local’ and double click on your running application (a child eclipse in my case), you can see its properties. Make sure that you run it as your own user and not sudo. Perform a full update of your system (sudo yum update). Try to close all running Java applications. Launch VisualVM, then try your luck again. Attach VisualVM to your application. Perform the operation that causes the sluggish performance. Now go back and comment out most of the code of your program to the point where the application just start & stops. Repeat until the application doesn’t leak at all. 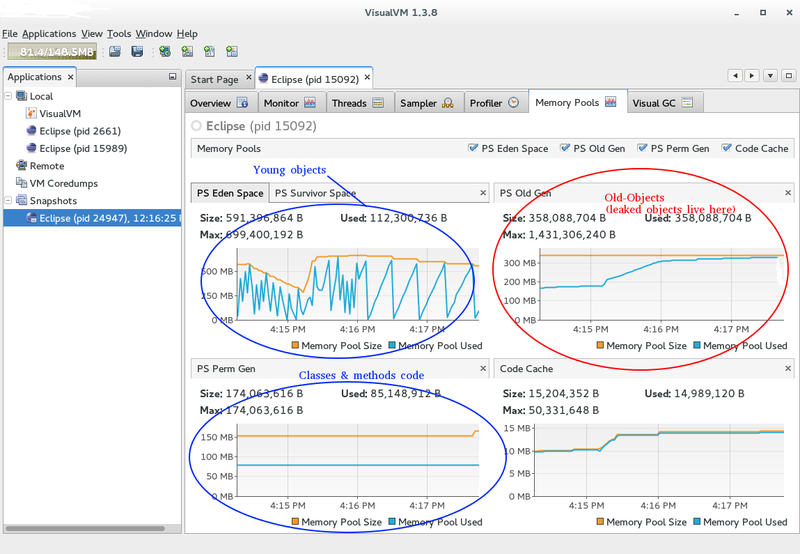 Then through several iterations re-enable parts of your code and inspect VisualVM memory usage. When your application starts to leak again, go into the method that caused the memory leaks and narrow down further. Eventually you’ll narrow down the problem to a single class, perhaps even a single method. Once you’re there, carefully validate that all file-buffers are closed and Hashmaps are used properly. As a note, if you test in your main Eclipse, it’s recommended to test in a ‘clean’ child Eclipse instead. Or in some ‘clean’ instance of your Eclipse, because other plugins will get in the way of accurate timing. I personally haven’t used this much, but folks rave about ‘Heap-dumps’. 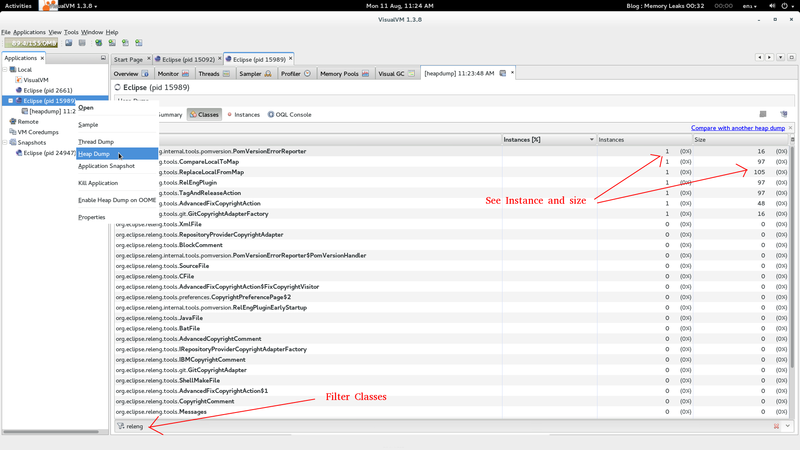 At any time, you can take a heap-dump and then see how many instances of classes are open and how much space they utilize. You can double click on them to see their content. This is useful if you want to see how many objects your application generates. Hold on, my application doesn’t have leaks but it’s still slow? It’s possible that you don’t have any leaks in your code, but it’s still very slow. In this case you’ll have to profile your code. Code profiling is out of the scope of this article, but there is a great youtube lecture that explains how you can profile with Eclipse using free and paid profilers. Memory leaks in Inner classes and this is also useful. Skim over oracle’s JVM GC guide.